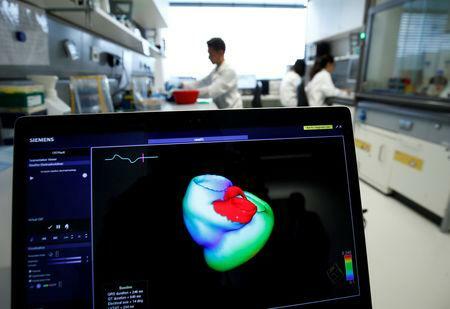 OXFORD, England (Reuters) - A new method of analysing images from CT scans can predict which patients are at risk of a heart attack years before it occurs, researchers say. "If you are able to identify inflammation in the arteries of the heart then you can say which arteries ... will cause heart attacks," Oxford Professor of Cardiovascular Medicine, Charalambos Antoniades, told Reuters. "With the new technology that we have we can achieve this by analysing simple CT scans." "(We) can say ...your arteries are inflamed and a narrowing will be developed five years down the line. So maybe you can start preventive measures to avoid this formation of the plaques," Antoniades said. "Although we have not estimated the exact number of heart attacks that we can prevent, we could potentially identify at least 20 or 30 percent of the people before they have (one)," Antoniades said.